Courtyard By Marriott, Mumbai hosted a wedding brunch that we recently attended. The theme, being an Indian wedding, all aspects of it were set according to one. The idea behind this was to create a wedding setting that is inclusive of the right ambience, delicious wedding-worthy food and wonderful hospitality - The skilled and professional team at Courtyard by Marriott nailed every detail. We walked into a lobby that had an extremely tall, multi-layer wedding cake that stole all the attention. We were then lead to a well-decorated space filled with food that looked delicious. Since the theme was an Indian Wedding, Marriott made sure that the decor was justified. Beautiful bouquets, elegant lighting and stunning florals centrepieces with crystal details were the highlight. To make the wedding ambience all the more real, they even had mock mandaps, a reception stage, a photobooth and more. Each of them was decorated to perfection, with the right combination of floral, crystal and quirky elements. Now, coming to the food, the menu was designed primarily according to Indian tastebuds, but they also had a number of continental dishes that did not compromise in quality. The buffet hosted a wide range of Indian starters, curries, breads and more. In addition to this, mainstream continental dishes along with a variety of pasta was available. The chaat counter was especially good (something every Indian can not do without!). The Indian menu was based off Rajasthani, Gujarati, Maharashtrian and Punjabi cuisine, which covers most of North Indian dishes. The staff was extremely hospitable in catering to the slightest of customer needs. The dessert counter was well-stocked with a vast variety. 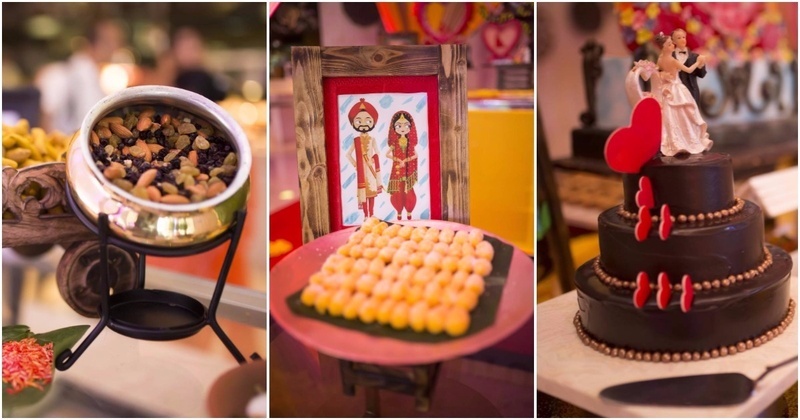 It included Indian sweets like laddoos, halwas and jalebis, hand-made chocolates, pastries, toffees, cookies and of course, multiple wedding cakes. Some desserts like jalebi had a live station where they were being freshly made. The cakes (all representing a wedding theme) were all designed beautifully with various Indian wedding elements. And they tasted just as good as they looked! We ended the brunch wishing we could magically fit more food into our bodies, because each bite was simply delicious. > The brunch at Courtyard by Marriott is perfect for a good ol’ Indian wedding. The menu is primarily customised to suit Indian tastebuds, though they also have a number of continental dishes. > The cakes are top-notch, with excellent quality and creativity in design. > The wedding decor is ideal for a Sangeet, wedding or any festive event. > It is steeply priced but the quality as well as variety of food justifies this. > Pro-tip : Have extremely small helpings of everything, so you can taste a little of each! Trust me, you want to.